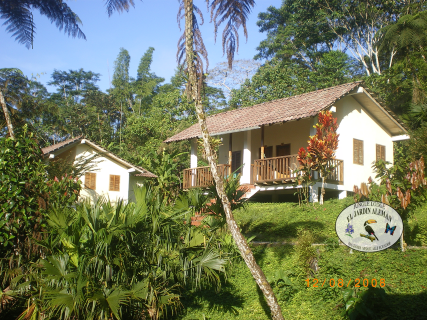 The Jungle Lodge El Jardin Aleman was opened in January 1996 and is surrounded by 125 ha protected primary and secondary rainforest. Apart from the hotel grounds, belongs to the Lodge 100 ha protected rainforest on the banks of the Napo River. The resort is built on 5 ha. 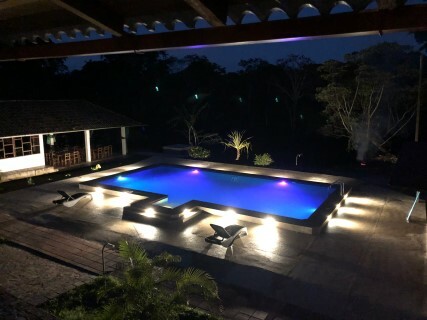 The Lodge is located on the banks of Misahuallí River, a tributary of Napo River , which forms after about 1400 km, in Perú, the Amazon. These rivers are so called White Waters. That means that they or their tributaries rise in the Andes Mountains and they always carry sediments along. This is also why they are relatively eutrophic and they look muddy and dirty because of the stirred up sediments. The opposite is Black Water. These rivers or lakes rise in the Amazon Basin by ground or rainwater; because of weathering of plants, they are very acid and dark, but clear and oligotrophic water. The closed village to the hotel, 4 kilometres away, is Misahuallí. For a long time Misahuallí village has seen the end of the road and the starting point for journeys into the Ecuadorian part of the Amazon rainforest, which was completely undeveloped until the discovery of petrol 30 years ago. Here at the foot of the Andes the altitude is about 500 meter and you find a tropical climate. There are no marked seasons because of nearby equator. The temperature is in between 15-18° C by night and 28-33 C during day. Clothing is the same all the year: light, cotton clothes, long pants and long-sleeved shirts for the jungle walks, sun hats and sunglasses indispensable. (Rubber boots you get in your Lodge). Don't forget your photo camera! In the so-called upper Napo region live the indigenous Quichua. The main cultivation is among others the Yuca (the most important local staple food, a starch root), several species of bananas and rice (both imported from Asia, nowadays staple food), corn (mainly for feeding animals), coffee and cocoa (for sale) and fruits such as pineapple, papaya, citric fruits, avocado and chirimoya. louring, drug or building material for the natives. II. Our efforts to conserve environment and to contribute to biodiversity is reflected in the protection of 556 acres (225 hectares) of primary and secondary Rainforest.